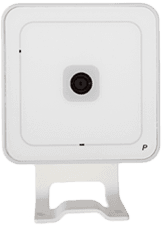 The Vivint fixed video camera lets you know exactly what is happening in your home–even when you are not there. By downloading a free app on your compatible SmartPhone or computer, you can view live feeds of footage your fixed video camera is picking up from almost anywhere–work, vacation, or even stuck in traffic. You can even save clips and view them at a later time.